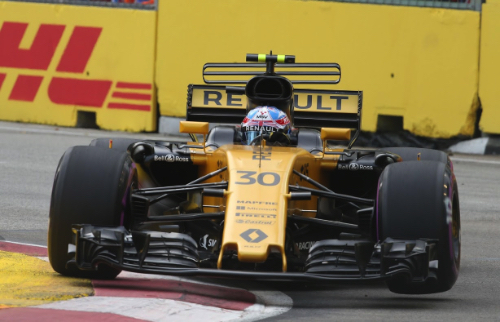 Jolyon Palmer says he intends to keep his Renault seat at least for the rest of the 2017 season. Although confirmation is still lacking, strong rumours in Singapore suggest the French team wants to kick off its new 2018 lineup of Carlos Sainz alongside Nico Hulkenberg as early as the next race in Malaysia. But Briton Palmer says he has a valid contract at Renault for the remaining seven races of 2017. "I've got seven races to do," he said. "I'll be in Malaysia. I'll be racing until Abu Dhabi. "I have a contract. There have been suggestions for the past 35 races that I might not be at the next one, so this is nothing new for me -- it's water off a duck's back," Palmer insisted. However, while officially everyone in the paddock is remaining quiet about the McLaren-Renault, Toro Rosso-Honda and Sainz-Renault deals, Palmer at least admits that seismic moves are happening behind the scenes. "I don't care too much to talk about it," he said. "I know what's happening. "I think there will be announcement at some point in the future, not too long. For me, I'm excited about the future. I haven't thought too much, but I'm excited for what's to come." Sainz's manager Luis Garcia Abad was seen in conversation with Renault boss Cyril Abiteboul in the Singapore paddock on Thursday. When asked about Sainz joining the team, Renault said: "Wait for the announcements."